“There’s no point in learning for a future that doesn’t exist.” With this motto, more and more young people this year have taken to the streets every week to fight climate change. On January 18, more than 30,000 school students in more than 50 cities across Germany went on strike. Last Friday, 10,000 of them went to Berlin to exert pressure on the Coal Commission, which presented its results of negotiations at the weekend. There have also been large demonstrations in Switzerland and Belgium in recent weeks: on 18 January, 22,000 school students went on strike in Switzerland; on Thursday, 24 January, 35,000 young demonstrators marched through Brussels - making it the biggest youth protest in many years – and, three days later, up to 100,000 people took part in another climate change protest there which was also in solidarity with the youth actions. The movement has been growing rapidly for weeks. Following the example of the school students strike actions in Sweden, local groups of “Fridays for Future” have now formed in over 100 German cities. Even in smaller cities such as Gießen (1,200 on 25 January) or Mainz (1,600 on 18 January), they bring thousands of people onto the streets who are not afraid of punishments such as negative testimonials or reprimands. Many of those who are now building the movement are getting politically active for the first time. There is huge anger after the UN climate conference in Katowice in December, where politicians did nothing but heating air again. Only the Swedish schoolgirl, Greta Thunberg, who had initiated a new youth movement with her weekly school strikes in the hot summer of 2018, had spoken clear words there and accused the audience of not being “mature enough” to “say how it is”: “Our civilization is being sacrificed so that a very small number of people can continue gathering enormous amounts of money”. She called for a different climate and energy policy and for compliance with the Paris Climate Convention (limiting global warming to below two degrees), which the Intergovernmental Panel on Climate Change (IPCC) estimates will require global emissions to be cut by half in November compared with the current level. According to figures from the Federal Environment Agency, around 900 million tons of carbon dioxide and other greenhouse gases are emitted annually in Germany, around 35 percent of which come from coal-fired power plants. Industrial companies account for 21 percent of emissions, while transport accounts for 19 percent, which have recently risen again in both sectors. This anger towards the irresponsibly acting established politicians could be felt on 25 January at the demonstrations in many apt and funny slogans on colourfully painted signs and in loud demos (e.g. “It’s our future, you assholes!”). Many demanded leaving coal energy as fast as possible, a demand, which 73 percent of German population support, according to opinion polls. The reason for the central action in Berlin was the meeting of the Coal Commission. The official name of the Commission, “Growth, Structural Change and Employment”, which discussed the conversion of energy production and is to make a recommendation to the Federal Government, already suggests the dominance of economic lobbyists. In fact, of the 28 members entitled to vote, seven are direct representatives of industry and commerce, five are scientists, three are representatives of environmental associations and three of trade unions, five are “representatives of the lignite mining regions”, three of the four chairmen are CDU and SPD party members. The “recommendation” of these people is not very helpful: in the final paper, lignite and hard coal-fired power plants with a capacity of around 12.5 gigawatts are to be taken off the grid by 2022. The last plant could run until 2038 (! ), which would miss even the official climate targets. Neither the Hambach forest nor the places threatened by forced resettlement in the lignite mining areas in Lusatia and the Rhineland are out of danger. The Commission considers the preservation of the Hambach forest merely “desirable” and “asks ... the state governments” for a “dialogue on resettlement” with the affected people, “in order to avoid social and economic hardships”. In the autumn of 2018, the Hambach Forest, a small piece of forest near the Hambach open-cast lignite mine, which had been forcibly evicted by the police after years of struggle and occupation, and re-occupied by activists later on, had become a symbol of the movement against coal-fired power generation. In September and October, tens of thousands of people protested there several times over weeks, and activists had occupied excavators and trees. Under the resulting public pressure, the clearing of the forest could be stopped for the time being. According to the Commission, the regions affected by the coal withdrawal are to receive 40 billion euros in structural aid over the next 20 years. Energy companies such as RWE are also to be compensated with public money for the shutdown of the power plants. Nevertheless, energy company RWE already announced that it might clear the forest anyway, and hastened to stir up the panic by announcing massive job cuts until 2023. What demands and structures for the movement? While the Green Party, Greenpeace and the big environmental organisation, BUND, officially welcomed the final report, Fridays for Future spokespeople criticised it as unacceptable. However, concrete demands or ideas for an alternative energy policy are not to be found in speeches, press statements or on the movement's homepage. FFF's “Open Letter” to the Commission with the subject "Youth demands the quickest possible exit from coal and a genuine future policy" also remains vague, rather appealing to bourgeois politics. In the climate movement, the idea of saving the planet through individual consumer behaviour, having been shaped mainly by the Greens for decades, still dominated. However, some local FFF groups, like in Mainz, are discussing and expressing more far-reaching demands such as zero fares for public transport. Members of the Green Youth such as Luisa Neubauer are responsible for the public image of the movement. BUND Youth and Greenpeace Youth are involved in the structures. Because the structures of the movement are still very loose and the activists coordinate themselves mainly through messenger groups, little is defined programmatically. Therefore, the movement must be further developed and armed with a strong programme bringing together school students, university students and workers in a struggle. This also includes communication and organisational structures with which one can exchange ideas nationwide, network and develop common, clear demands in order to reach many more people and be able to offer solutions to their problems. Such measures don`t reduce the danger of people coopting the movement, but only serve smaller circles of organisers as well as large organisations dominating the movement, which have other ways to make themselves heard. All non-racist organisations fighting against climate change should have the opportunity to express themselves freely. For example, if there is a risk of appropriation, it can help to let only students decide when voting in groups. On February 1, there will be another international action day of ‘FridaysForFuture’. The next important protest day is the worldwide student strike on March 15. 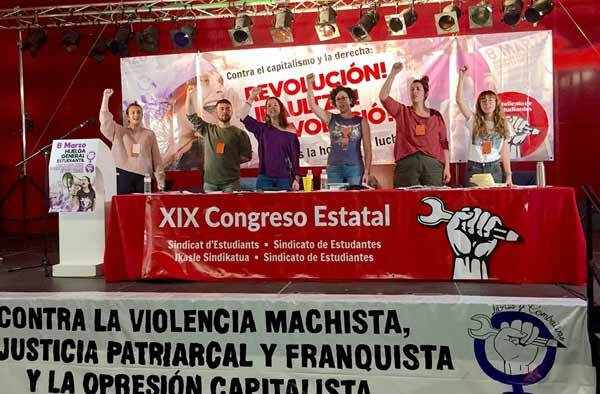 SAV members participate in the movements actions and discussions, supporting the method of student strikes to put pressure on the workers' movement. In a day of strikes actions, environmental organisations, the LINKE party and the trade unions should also mobilize broadly - especially the trade unions whose leadership must put an end to the outdated 'environment vs. jobs' propaganda, to fight together for the expansion of the renewable energy sector and the preservation of all jobs. SAV advocates the immediate phasing out of lignite and the complete conversion of energy supply to renewable energies. At the same time, we demand that all those currently employed in the coal industry continue to be employed with equal guarantees in climate-neutral energy sectors. It is not the state that should pay for this, but the companies that have made their profits by destroying the environment and damaging the planet. The largest energy companies must be transferred into public ownership, under democratic control and management by elected representatives of the workforce, the working population, consumer and environmental organisations. In order to change course in the transport sector, we do not need an increase in fuel and kerosene taxes, but above all free public transport, the massive expansion of rail and an increase in train frequency. “As long as you do not concentrate on what is necessary, but only on what is politically possible, there is no hope. (...) We must leave fossil fuels in the ground and we must focus on justice. And if solutions within the system are impossible to find, then perhaps we have to change the system itself,” Greta Thunberg said in her speech to the UN Climate Change Conference in Katowice. And indeed: in the capitalist economic system, the only thing “politically possible” is what is in the interest of the banks and large companies, i.e. creates profits. Cheap production processes, products which do not last, privatisation etc. are not compatible with a real climate rescue programme. It is not “we” and “our selfishness” that cause all the problems, but capitalism. But “we”, the working and young people, can be the solution to the problems if we take society into our own hands, putting the economy and large companies into the hands and control of the population, so that the necessary investments are made and the economy and society are democratically planned and run according to the needs of people and the environment. This perspective of a socialist society is necessary if humanity is to have a future.